Much is written about valuations of public biotech companies. But what about valuations of startups? 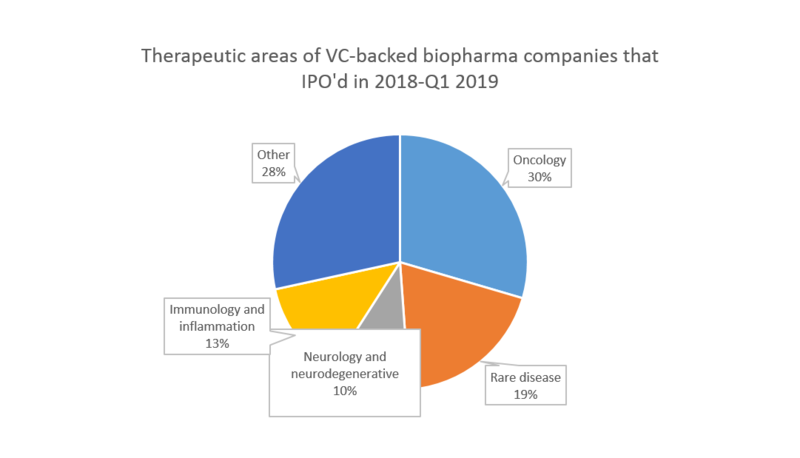 In this post, I’ll examine the valuations of venture investments in biopharma companies that went public in 2018-Q1 2019. I'll also explore the characteristics of these companies: development stage, therapeutic area and therapeutic modality. I'll wrap up by checking in on the status of the IPO market -- can we expect the strong IPO market with rising valuations to continue? 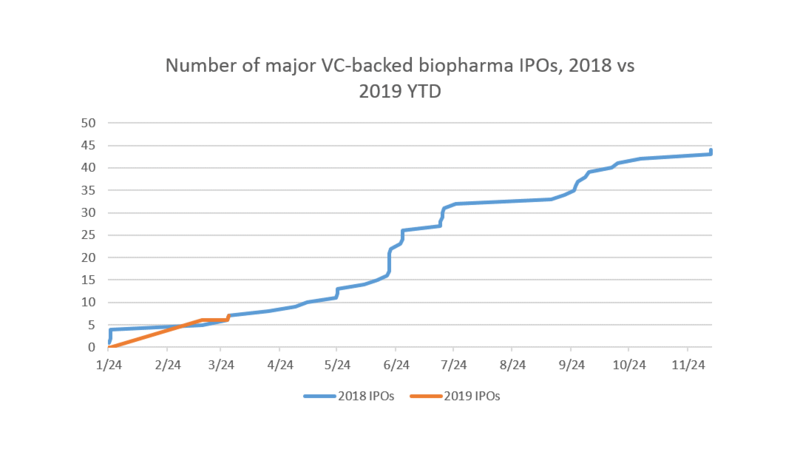 Biotech companies are growing fast and going public quickly: companies are going public ~3 years from Series A, and less than one year from Series C. The average fully diluted valuation at IPO of companies that went public from 2018-Q1 2019 was $754M (median $501M). 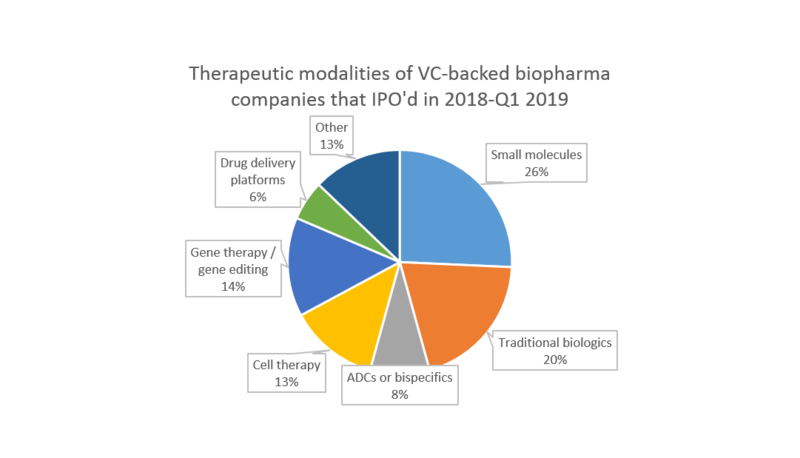 Small molecules are out, novel modalities are in: there are as many gene and cell therapy programs as small molecule programs among the companies that went public 2018-1Q2019. Other sources have tracked valuations of IPOs over time, but I haven’t seen much publicly available data on the valuations of companies at the time of venture investments. It is possible to estimate the valuations of venture investments in public companies by looking at SEC filings 1. There isn't enough information disclosed to get valuations exactly right, but in many cases you can get fairly close. 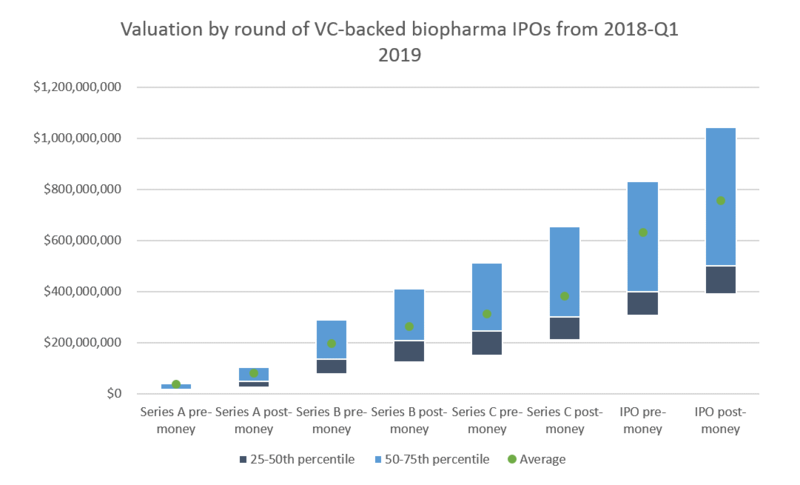 Below I show the estimated pre- and post-money valuations of Series A, B and C investments, as well as IPO valuations, of venture-backed biopharma companies that went public from 2018-Q1 2019. Overall, I looked at 50 total companies (only including VC-backed companies that did IPOs of over $50M on NASDAQ or NYSE in 2018 or Q1 2019). All of these companies raised Series A rounds, 49/50 raised Series B rounds, and 29/50 raised Series C rounds (only 7 raised Series D rounds, so I did not include D rounds in the analysis). I was able to estimate valuations for 39/50 Series A rounds, 44/50 Series B rounds, and 25/29 Series C rounds 2. The average / median Series A round was $36M / $24M, and the average / median Series A post-money was $79M / $48M. The average / median Series A round bought 57% / 60% of the company. The typical B round bought ~1/3 of the company, and C rounds generally bought 20% of the company. I’ll note that many of these companies are started in-house by venture funds, who seed the company, lead the Series A, then syndicate later rounds. These companies are often funded and controlled by the fund and managed, at least in part, by the fund’s employees through the seed-stage. By way of comparison, in tech, a Series A generally gets you ~25% of the company, and angel / seed rounds get ~20% of the company. However, Series A round sizes are much lower in tech: the median Series A round in 2017 was $6M. Only the most successful startups can IPO, so this dataset represents only the most successful companies. What are the characteristics of these companies? 27% of programs were gene or cell therapy programs, and 9% were antibody-drug conjugates or bispecific antibodies. 13% were “other” modalities, including novel modalities like mRNA therapy, microbiome therapy, and viral therapy, as well as more traditional but less common modalities like therapeutic peptides, polymers and glycans. Surprisingly, small molecules represent only 26% of development programs of newly public companies. According to HBM's 2019 New Drug Approval report, over the last ~10 years, ~75% of new FDA-approved drugs have been small molecules. Before then, I'd imagine small molecules' share of new drug approvals was even higher. Why the focus on gene and cell therapies? One potential explanation is that's what pharma's buying. Many of the largest acquisitions of venture-backed startups in the last two years have been gene or cell therapy companies – Kite, Juno, AveXis, Spark (with Loxo representing small molecules). IPO investors may be betting that more big pharma companies will acquire gene or cell therapy franchises. As discussed above, IPO investors are increasingly interested in gene and cell therapy companies. Do these companies garner higher valuations? Average IPO post-money valuations for gene and cell therapy companies are $754M, while IPO post-moneys for small molecule companies are $461M. Median post-moneys were $508M for gene and cell therapy and $412M for small molecules. 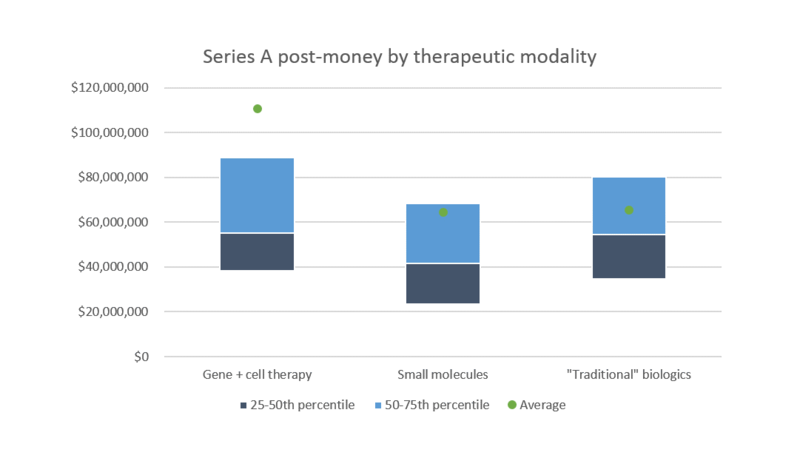 The 25th percentile post-money for gene and cell therapy is higher than the median small molecule post-money (see footnote 4 for some notes on methodology). What about venture round valuations? From an investor's standpoint, valuations don't mean a lot in and of themselves. If it takes $1B to grow a gene therapy company to a $1B valuation, that isn't too appealing. 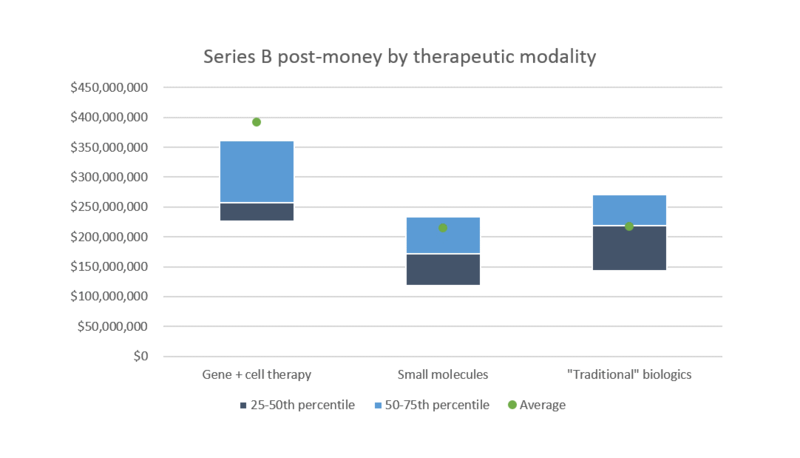 The final analysis I'll show is comparison of capital raised to IPO across different therapeutic modalities. We see that gene and cell therapy companies require (or at least raise) more capital to get to IPO. 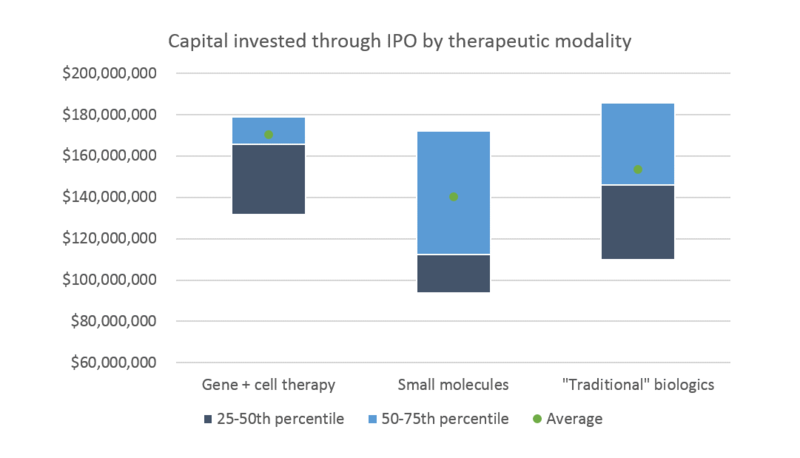 The 25th percentile amount of capital raised pre-IPO for gene and cell therapy companies, $132M, is greater than the median capital raised pre-IPO for small molecule companies, $112M. The average amount raised is $140M for small molecules and $170M for gene and cell therapies. How does this translate into returns? That's a more complex topic for another post. In short: everyone seems to be doing pretty well, from Series A investors to IPO investors. Despite a rough end of 2018 and the government shutdown temporarily halting the IPO market, 2019 is shaping up to be a good year for IPOs. 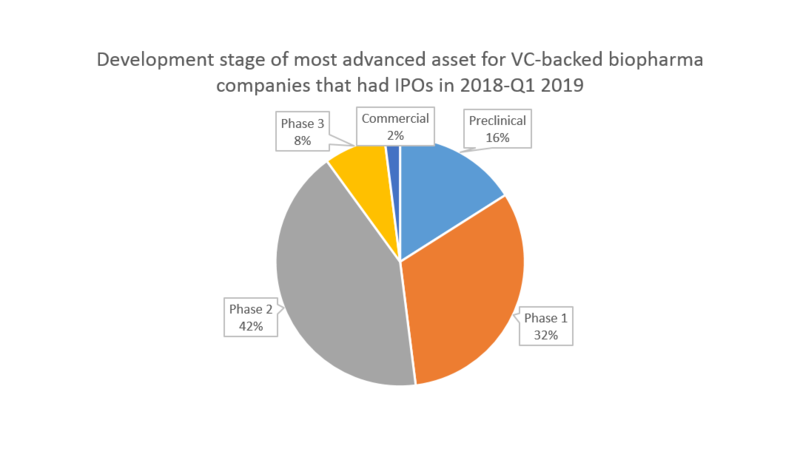 2018 was a huge year for biopharma IPOs and venture funding. With the first quarter of 2019 behind us, how is this year shaping up compared to last year? By my count, there were 7 major (major = raised at least $50M in IPO proceeds) venture-backed biopharma IPOs on US exchanges in Q1 2019 (excluding NGM, which was in Q2) that raised a total of $882M. In Q1 2018, 7 venture-backed biopharma companies went public, raising $675M. 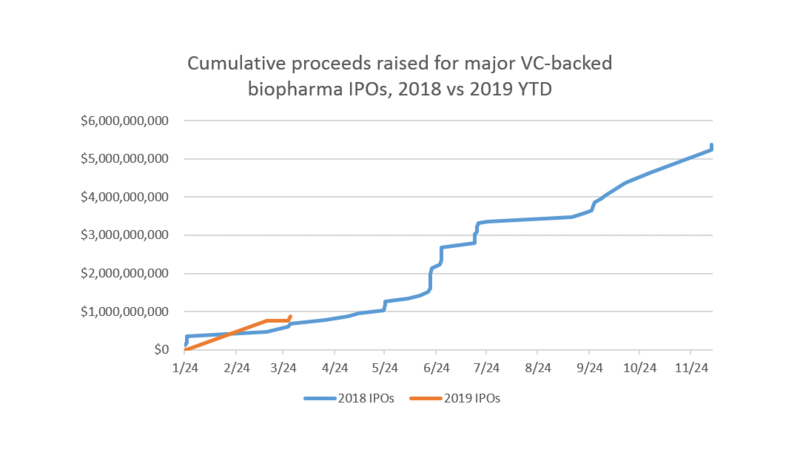 Thus far, 2019 biopharma IPO activity is on pace with 2018. However, the first quarter of 2018 was relatively quiet, with a flurry of IPO activity in the summer driving much of the year’s IPO activity. If the rest of 2019 sees the same pace of IPO activity as we saw in the first quarter, 2019 will end up with ~40% fewer IPOs than 2018. 1 All data comes from IPO prospectuses from the SEC's EDGAR database. I used split-adjusted data on preferred shares invested and price per share at each round, common shares outstanding, authorized options, and other dilutives shares to estimate valuations. In cases where data on common shares outstandng were not available within 6 months of the time of investment, I did not estimate valuations. In cases where option pools weren't disclosed, I estimated based on average option pools that were disclosed. 2 One of the main reasons for not being able to estimate valuation was that the venture rounds occurred before 2015-2016. IPO prospectuses generally do not provide info on common stock outstanding going back more than two years, so there is no way to tell how much common stock was outstanding, or how many shares were in the option pool, at the time of pre ~2016 venture rounds. This is why more B and C rounds have valuation data available than Series A rounds. 3 Many companies have multiple programs with different therapeutic modalities. 4 A quick note on methodology: I looked at each program of the recently IPO'd companies and classified them by therapeutic modality. I then aggregated and analyzed this data. Some companies have products with multiple therapeutic modalities, so the number of programs exceeds the number of companies. However, there were no companies that had both small molecule programs and gene or cell therapy programs, so we can compare across those categories. There are companies with both between gene / cell therapy and large molecule programs, and with both small molecule and large molecule programs, so it's harder to compare these programs .